↑ (2006) The River of Lost Footsteps. Farrar, Straus and Giroux. ISBN 0-374-16342-1. ↑ Naing, Saw Yan (January 22, 2009). 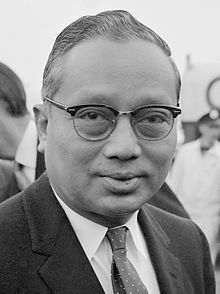 Remembering U Thant and His Achievements. The Irrawaddy. ↑ H.W. Wilson Company (1962). Current biography, Volume 23. H. W. Wilson Co.
↑ Dunlap, David W. "Bronx Residents Fighting Plans Of a Developer", The New York Times, November 16, 1987. Accessed May 4, 2008. "A battle has broken out in the Bronx over the future of the peaceful acreage where U Thant lived when he headed the United Nations. A group of neighbors from Riverdale and Spuyten Duyvil has demanded that the city acquire as a public park the 4.75-acre parcel known as the Douglas-U Thant estate, north of 232d Street, between Palisade and Douglas Avenues. "